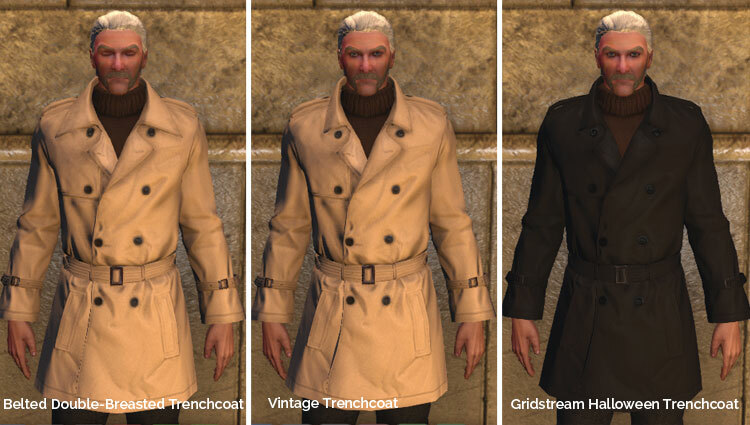 Note: Same style as the Open Leather Coat, added to the game a bit latter on. Price: 540 FC single character / 675 FC account wide. Note: This is a back-slot items and cannot be worn with a jacket. Item shown with a Shirt and Tie as well as a Buttoned Plain Shirt and t-shirt for reference. Price: 360 FC single character / 450 FC account wide. Non-Shop Option: There is a black, blood covered version from Halloween. Price: 540 FC single character / 675 FC (?) account wide. 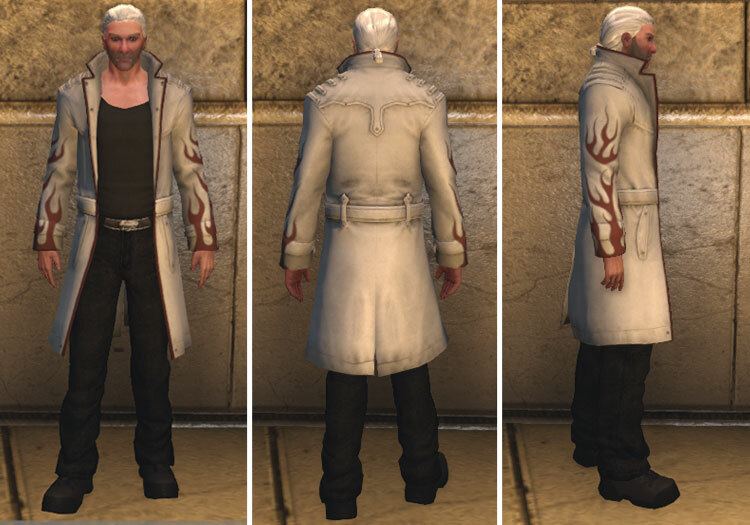 Non-Shop Option: This coat is the same style as the achievement reward item San Diego Jacket, which comes in red. Sets: Black and white jackets are available as part of the Spy Tux outfit sets. Sets: Matching colored pants sold separately, see Pleated Tuxedo Pants. Sets: This coat is also part of the Casual Steam outfit set. Note: This jacket is the same model as the one in the Snakeskin uniform from pre-order. They come in different colors though rather than the black and tan jacket that the uniforms incorporate. Non-Shop Option: The People of the Dawn achievement rewards a green poncho. Non-Shop Option: Two similar hoodies, both Academy and not College, are available as in-game rewards. A blue and white print Innsmouth Academy Hoodie and the Innsmouth Hoodie, White with Blood. Price: 250 – 400 FC single / 313 – 500 FC account wide, depending on colour. Price: 250 FC single / 313 FC account wide, depending on colour. Price: 250 – 600 FC single / 313 – 750 FC account wide, depending on colour. Price: 400 – 540 FC single / 600 – 750 FC account wide, depending on colour.